The most recent discount codes from the domain name registrar EuroDNS are available below. Since often there are several promo codes for a certain domain extension you should check the whole list in order not to miss some of the voucher codes you need. If you don't have a registration at EuroDNS you can sign up here. To use a promotional offer enter the discount code in the section "Voucher Codes" or use it during the process of a particular domain name registration. If you haven't heard of EuroDNS yet, read the following EuroDNS review. Browse the Review Maze to find other promo and voucher codes. 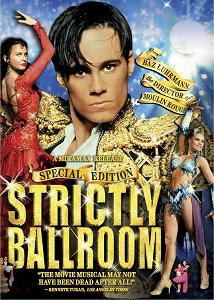 Strictly Ballroom is the debut movie of Australian director Baz Luhrmann (Romeo + Juliet, Moulin Rouge!, Australia). Unsurprisingly, it is a movie about dancing. It does not feature big actor names and it does not offer anything original or groundbreaking. If you expect great cinematic achievements this is not the right film for you. Strictly Ballroom is a romantic comedy with a recycled plot that offers moderate entertainment based on dancing competitions. If you are into romcoms or dances, it could be your thing. Strictly Ballroom is about Scott Hastings (Paul Mercurio), a promising ballroom dancer who participates in Australian dancing competitions. He has one major "problem" though and it is his belief in using his own steps, which is something not to the taste of the Championship's orthodox judges. Due to his lack of respect for the conservative rules, Scott loses his regular female partner Liz (Gia Carides) and Fran (Tara Morice) who is neither as beautiful as his former partner, nor such a skilled dancer, decides to take the place of Liz next to Scott. The new couple decides to win Pan-Pacific Grand Prix Championships and to show everyone new dancing steps should not be ignored. The plot of Strictly Ballroom does not offer genuine storytelling. There is a standard romantic relationship, there are people who are against the innovative couple, there are parallels and references to the past. Some of the characters are far over the top but it's part of the movie's style and the director's vision. Naturally, unexpected twists, profound dialogue or life-changing discoveries are not something you will find in a film like this. Like every other movie, this has also some good aspects worth mentioning. The most notable objects in Strictly Ballroom are the costumes. There are plenty of them so if you are into costume design, you have one more reason to see the movie. There's a family with Spanish origins that demonstrates real pasodoble dancing and these scenes are among the highlights in the film. The movie could also be considered inspiring although at the same time its cartoonish flavor and excessive sentimentality detracts from this of its qualities. Baz Luhrmann does a good job and visually the movie is Ok. You won't be surprised by the story or its ending, neither you will see any great filmmaking accomplishments but it has hardly been the creators' intention. Strictly Ballroom is one of those movies you can watch together with your loved one(s) and care for the characters along the way.